Hebron - Israel has revived a long-lapsed policy of destroying suspected militants’ homes after the dead bodies of three Israeli teenagers missing since June were found on Monday. The army reverted to the practice to punish Marwan Qawasmeh and Amer Abu Aysha, two fugitives it accuses of killing the Israeli teens who went missing while hitchhiking on June 12. Dazed neighbors of all ages visited the shattered Abu Aysha home in Hebron on Tuesday to comfort family members and curse the Israeli perpetrators. “This is a country that tells the world it wants peace?” asked Amer’s uncle Mohammed, standing in the soot-encrusted second floor salon, now blown open to the blue sky. Before blowing up the house, soldiers shattered the windows and threw sofas to the ground. Toilets and sinks, along with every step in the staircase, were smashed with a sledgehammer. Sugar, yogurt and bread were thrown across the kitchen floor. After flames gutted the house, a chorus of Palestinians shouting a defiant “God is Greatest!” rang out in the darkness. Rights groups and Palestinians deplore the practice, saying it harms innocent families. 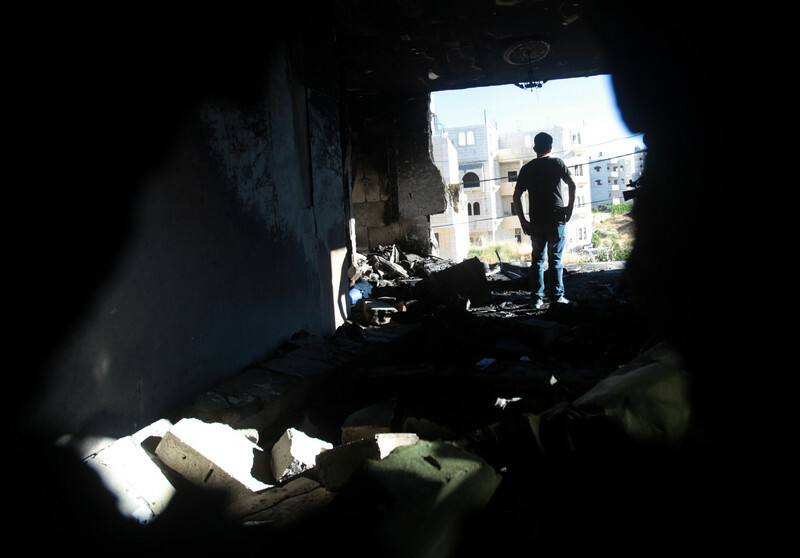 Israel’s army blew up or demolished militants’ homes for decades, but stopped the practice in 2005, saying it was counterproductive in their effort to discourage attacks. Also on Tuesday, in the city of Modi’in on the border of Israel and the occupied West Bank, thousands of heartbroken Israelis attended the joint funeral of the slain teens after the case elicited an outpouring of sympathy in Israeli society. On Monday, Israel’s high court rejected an appeal by an Israeli rights group to an army decision to soon demolish a third home in the Hebron area, citing “a steady deterioration of security stability” in the Israeli-occupied West Bank. The home belongs to the family of Imad Awwad, who was arrested this month on charges of shooting dead an off-duty Israeli police officer in April. “Taking into account the severity of the attack, the (military commander) decided to exercise his authority ... in relation to the dwelling in which Awwad lives and to order its demolition as a deterrence,” the court said. “Chief victims are the occupants of the demolished house rather than the alleged perpetrator,” it said in a statement. Awwad’s elderly mother, sitting anxiously in her traditional woven robe and white headscarf in their threadbare home in Idhna village, said her family had nothing to do with the dispute. “We don’t want these problems. We just want to be allowed to remain in our house in peace,” she said, adding she thought her son was innocent and Israel wanted to make Palestinians suffer. Soldiers blocked the village’s main exit with concrete cubes, preventing its 20,000 residents and its workers - mostly labourers - from leaving at will. “They’re ruining us,” one villager said in the Awwad’s sitting room, crowded with well-wishers. “It’s collective punishment of course ... we haven’t spent one good day with them. Everything just gets worse,” he said. It's called a punishment for aiding and supporting murderers. Funny how these arguments sound legitimate at first--- this is what the Palestinian kid sees and you expect them to want peace??? Absent any other factors this logic may actually hold some water. But a deeper perspective yields the realization that regardless of what our side does, your side is committed to educating and raising these murderers from the cradle and the propaganda you guys back with these Israeli actions is only the cherry on top. You are developing blood thirsty animals out of your innocent children because of your blind hate of anything Jewish. Their stated policy is no peace with Israel, rather every piece of Israel. Read the Hamas Charter It's very clear. LOOK AT THE YOUNG BOYS YOUR NEPHEW MURDERED. OH WAIT YOU CAN'T THEY'RE IN THE GROUND!!!!!! Why don't they all move to Jordan , & see how much fun that is ? Could you believe its Magic! I hope that they played Suite Home Alabama while the demolished the homes of the criminal wicked! I might even add that you could play "Almost Heaven, West Virginia" too since that might be a place these little interloping cringing hate monsters might find appealing. At least they could live in America. But lets face it, Saudi Arabia and Iran should take them all. In a few years, Syria might be ripe for the palestinian to return to his own roots. Let them Drink Beer to their Lapsed Memory. And let them eat their own commodity of precise regulated rational hateful fear of G-d. They are not Torah friends and they have no place on Jewish soul! I would like to focus the attention of this chevra on just two sentences in this article by Reuters, please indulge me. 1. "Dazed neighbors of all ages visited the shattered Abu Aysha home in Hebron on Tuesday to comfort family members and curse the Israeli perpetrators." Isn't it a tell? According to Reuters, Jews are perpetrators without a doubt, while those arab beasts who murder Jewish young are merely "alleged" perpetrators. Need we listen any longer to what "the world" has to say? When a rocket hits a school those children did nothing wrong either. The only difference here is that Israel is taking it out on their money, not of the village's children and citizens. They get far less than they deserve. No mercy Israel, destroy the homes and leave the inhabitants inside, too! The Israeli government tells us Hamas planned this crime. But the Israeli government also told us they knew who 'kidnapped' these boys. The government also told us the silence from the 'kidnappers' was because they were moving. Now they say they know how and who to punish. Somehow I doubt them at this point. I would suspect a dose of the same Israeli medicine will get the same results as always. “ The Israeli government tells us Hamas planned this crime. But the Israeli government also told us they knew who 'kidnapped' these boys. The government also told us the silence from the 'kidnappers' was because they were moving. Now they say they know how and who to punish. Somehow I doubt them at this point. NOW…you are getting it! They hide in plain sight and you don’t have to read between the lines…most of the time you will see lines in AMERICAN PAPERS TOO..”Occupied Territories” is a Dead give away! No Friend of Israel will EVER use that terminology! Paul…have you heard the tapes of the phone call from the boys as they were SHOT?! I suggest u get your hands on it THEN come back from Mecca & talk to me about it! On Page One the Israeli government is demanding the police find the people who killed these young men. On Page Three, the Israeli government is already punishing people. Seems to be putting the cart before the horse.